Millions of people suffer neck pain everyday which can be due to injury or strain. Even muscle tightness can be rather painful. Injury can occur from a sudden blow or impact to the neck, or may result from long term strain. For example, bending the neck for an extended period of time and repetitively, places strain on the nerves, muscles and bones found in the neck. An injury can occur from an unfortunate event such as a vehicular accident, which we commonly refer to as whiplash. 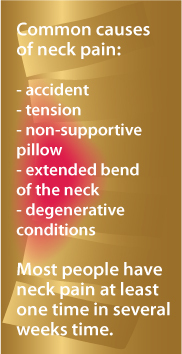 Stiffness or limited range of motion can happen to anybody...we recognize this by noticing we have a stiff neck. Turning the head without discomfort becomes difficult. Pain in the neck is never pleasant. Our body innately wants to correct the problem - notice how often people 'stretch' their sore neck by bending the head side to side, or massage the neck with fingertips. This can help momentarily but getting at the root cause is important to correcting the problem. And sometimes the problem has gone on far too long or is so severe that immediate chiropractic care attention is needed. Ahhh - relief! Fortunately, neck pain is successly treated with proven, evidence-based treatment methods by the doctors at Thorpe Chiropractic. This means your life is less disrupted. Contact TCO today to learn more or to get information about neck pain. At TCO, we care that you are able to live each day to the fullest - and without painful or hindering neck pain. Our doctors will review your health information with you to arrive at the best choice for treatment and therapy. Additionally, recommendations for simple ergonomic solutions can help you go about your daily tasks in ways that will help prevent further injury or discomfort. Ask Dr. Thorpe how you can apply simple techniques to keep your neck free of injury or pain.